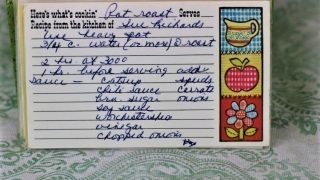 Front of the recipe card for Pot Roast. There is a notation that the recipe is from Sue Richards. 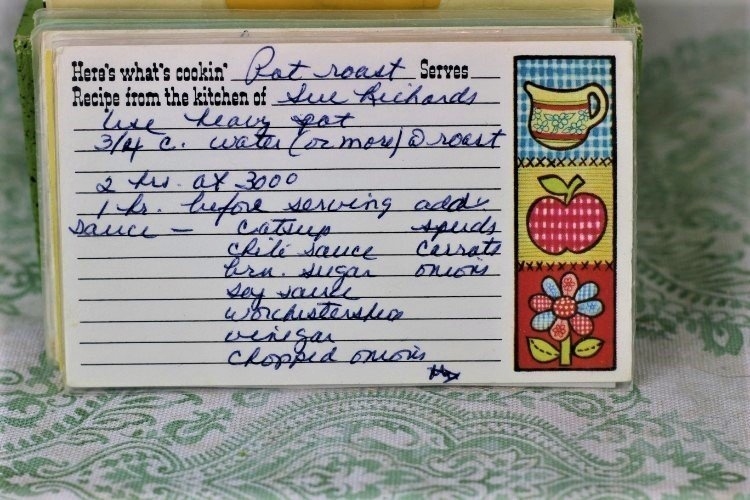 There are lots of fun recipes to read in the box this recipe for Pot Roast was with. Use the links below to view other recipes similar to this Pot Roast recipe. If you make this Pot Roast recipe, please share your photos and comments below! 1 hr. before serving add - spuds, carrots, onions. Sauce - catsup, chile sauce, brn. sugar, soy sauce, worcestershire, vinegar, chopped onion.